The Silver Skeptic: Sweet Zombie Jesus! You know, I was going to finish up that piece on the first cause argument I started a while back. Then I realized it was Easter. So rest assured that I will finish the first cause piece, despite delays from both April Fool’s day and Easter. But this week, I believe it is in my readers’ best interest that I share the story of Easter, which is also known as the story of the Zombie Apocalypse. I tell you this as an active member of the resistance group SKEPTIC, so that you may be aware the dangers of associating with the necromancer Yahweh, and with his zombie son. Now I know you’re probably confused right now, because there’s been a lot of disinformation thrown around in the past two thousand years or so. So I’m going to begin by telling you what’s really going on here, and what you can do about it. While it is not certain why John chose to write his report in the third person, it is clear that the skilled Ectomancer knows his trade. Jesus, after being resurrected by the Necromancer Yahweh, still had wounds and was still capable of eating. This demonstrates that Jesus is not a Ghost or a Wraith. It is also well-known that Vampires heal their wounds in a single night, which means that Jesus was certainly not a Vampire. But how can we rule out other forms of undead, such as Ghouls or Liches? The key is to look at John’s prophetic visions, gained through his séances. John’s report of his opium-induced séance with the legendary spirit Keiga includes a description of Jesus’s appearance at the end times, also known as the Zombie Apocalypse. In this report, John notes that Jesus appeared as “a Lamb as though it had been slain." Now we all know that John’s endearing use of the term “Lamb” to refer to his teacher only represent the fact that John had not yet understood the full terror of his teacher’s future. But that’s beside the point. The important fact is that even during the Zombie Apocalypse, Jesus still has his wounds. And that means that Jesus doesn’t heal. Not now, not ever. And that rules out your ordinary corporeal undead such as Ghouls and Liches. No, it is clear that Jesus must be a zombie. Now I know you’re probably thinking, “But wait a minute, when did Jesus ever eat anyone’s brains?” And this is a very valid question. We all know zombies have an insatiable appetite for brains. And the truth of the matter is that Jesus does eat brains. But he is very clever about this process, clever enough that he is rarely caught. In order to understand this, you have to look at the life, death, and undeath of Jesus. It is common knowledge that Jesus was the son of Yahweh, the greatest Necromancer of all time. This is well-evidenced by Jesus’ own necromantic skills, as witnessed by the great Magus Matthew. But what most people fail to realize is that Jesus and Yahweh were actually quite at-odds with each other. Of course, Jesus took great pains to hide this disagreement, mostly for fear of Yahweh’s wrath. However, Jesus was determined to save humanity from his father’s nefarious plots. This is in fact why his disciples often referred to him as a “savior.” For Jesus was a very powerful wizard, and for a time it was believed that he could overpower his father. This is why Jesus’ disciples clung to him as their savior. But what people don’t know, due to concentrated misinformation campaigns such as Project Catholicism, is that Yahweh intended Jesus to help him conquer humanity. Fortunately the organization SKEPTIC caught wind of this plot. We sent our top agents, Joseph and Mary, to steal the child away in the dead of night. They brought him to the secret hideout of our Jerusalem division, which was cleverly disguised as a manger. Three more agents, disguising themselves as wise men, came from afar to help guard the boy. And so Jesus was raised by the members of SKEPTIC. We taught him to master his impeccable sorcery while also maintaining a healthy reverence for human life. But when it came time to gather the people together for an ultimate push against the tyrannical necromancer, Jesus made one key mistake. He told the world he was Yahweh’s son. Now as you can image, the tyrannical Yahweh didn’t take kindly to the idea of his own son undermining his grasp on humanity. We are talking about the necromancer who slaughtered every first born son of Egypt, after all. So once Jesus identified himself, Yahweh did what every tyrant does in these situations, he killed the opposition and placed as much positive spin on the situation as he possibly could. As Jesus’ own disciples will tell you, it was Yahweh’s plan from the moment Joseph and Mary whisked Jesus away to murder his own son and resurrect him as an agent of the mighty Necromancer. But shortly after Jesus’ return, the disciples caught on to the ploy. In fact, the disciple Judas was so terrified by his zombified teacher that he thrice denied ever knowing the man. And while Jesus still talked about salvation, his promise of “eternal life” and resurrection for all queued his disciples in on the true situation. They quickly realized that their once-savior was now a pawn of an insane necromancer, hell-bent on bringing about the Zombie Apocalypse. Now you're probably still wondering, “What about the whole ‘eating brains’ thing?” So let me reassure you, Jesus does indeed eat brains. 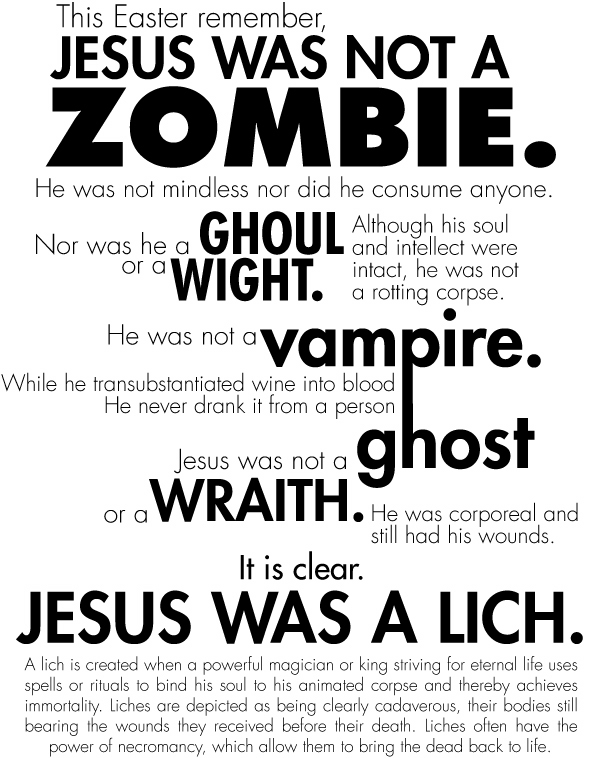 However, unlike your average zombie, Jesus managed to maintain most of his intellect upon his zombification. So rather than mindlessly attacking the nearest brain-bearing being, Jesus prefers to work behind the shadows. While Jesus does have necromantic capabilities, his primary talent actually lies in the Shamanic art of Spiritcraft (which is why he was so famous for casting out demons). His primary henchman goes only by the horribly inappropriate moniker “The Holy Spirit.” But make no mistakes, the purpose of this spirit is to slowly and gradually remove your brains and serve them up to its zombie lord. 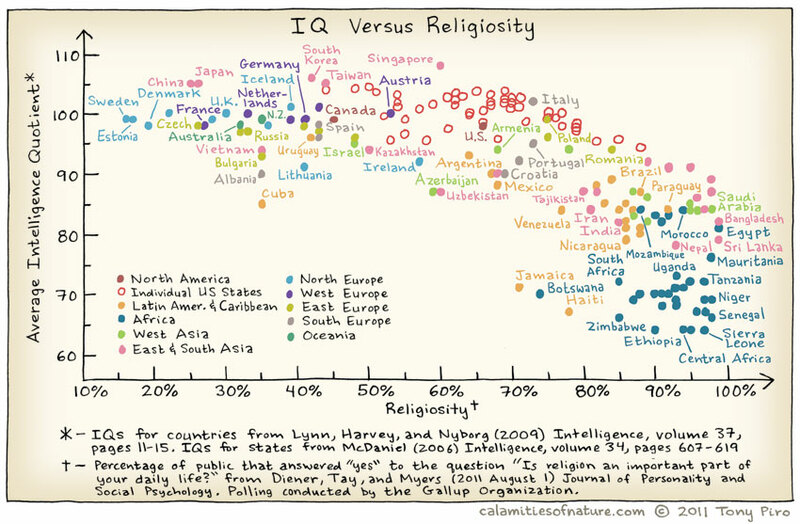 Now there is of course some variance in human IQ, but this research clearly shows the direct correlation between high religiosity and low intelligence. At this point, SKEPIC’s top alchemists were put to work investigating this correlation. 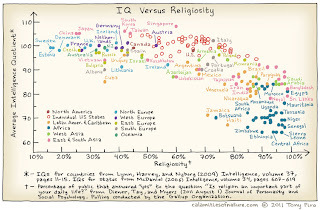 And they found that the primary source of this correlation is the blatant impacts of religiosity on one’s mental development. And why does religiosity hinder one’s mental development? Well, the alchemists found that mental development was most hindered in those religious members who routinely talked of spirits, particularly those who spoke admirably of The Holy Spirit. And all these spirits are working for the Zombie Lord Jesus, bound to him by his Shamanic rituals. In other words, Jesus is eating people’s brains. Upon this realization, the leaders of SKEPTIC, who are normally scattered throughout the world, held a meeting, which we cleverly disguised as the “Reason Rally.” Agent Tim Minchin volunteered to be our decoy, drawing the world’s attention with his enormous arsenal of F-Bombs. Meanwhile, top Skeptic thinkers met behind closed doors and tried to determine exactly how to respond to this new knowledge. While it had been two thousand years since we’d learned not to count on Jesus’ assistance, we now had direct confirmation that the rumors that Jesus was working with his father towards destroying the human race were not just another misinformation campaign. Jesus is in fact eating the brains of those foolish enough to fall for his tricks, making them more susceptible to Yahweh’s plots. Now I know this realization may frighten y0u, so let me give you some reassurance. First, if you are the kind of person who reads this blog, then you have already taken most of the measures necessary to keep the Zombie Shaman’s evil spirits at bay. However, SKEPTIC has decided to publish a guidebook to help inform people of the best ways to combat the threats of Necromancy and Spiritcraft. Just follow these simple tips and you’ll be as safe as Sagan. A stimulated, exercised mind is far less susceptible to the work of spirits. As shown by this research (See table 9.1) those who attend college are far less likely to join the ranks of the Zombie Lord. If you’re really concerned, the absolute best educational defense is graduate school. But even getting a Bachelor’s degree can provide you with some insolation against religiosity. While you may occasionally see a SKEPTIC agent interacting with these locations, keep in mind that SKEPTIC agents are highly trained in defense against religion. For your average citizen, the best bet is to simply avoid these dangerous places. Be particularly wary of religious gathering sites that have nearby cemeteries, as this indicates a high level of BRS activity (brain-robbing spirits). NOTE: Children are particularly susceptible to these locations. Make sure yours are well prepared before approaching these dangerous areas. As anyone who’s ever taught a subject can tell you, it takes an exceptional understanding of a topic in order to teach it well. If you can develop your own defensive techniques of skepticism and rationality to the point where you can begin to teach others, then not only will you help them avoid zombification, you will also further hone those skills yourself. SKEPTIC has come a long way in securing the safety of those who refuse to participate in Yahweh’s nefarious plots. While some locations are still hostile, most of the western world is at least non-lethal to free humans. By speaking up about the Necromancer’s evil ways you will build up your own confidence and security and may even help save those who are currently entranced by his magiks. But do be careful about these sorts of grass-roots rebellions. If you believe your area may be lethal or highly aggressive towards those outside the Cult, you may wish to leave the fighting to SKEPTIC’s highly trained agents. If you or someone you know is under attack by the Cult, please don’t hesitate to dial our hotline at 1-800-SKEPTIC. We are most active in Europe and America, and have even forged alliances with other rebellious groups such as the ACLU, the Ghost Busters, and the RRS. Don’t try to handle violent mobs or terrorist bombers by yourself. Call and we’ll send a highly trained agent to help defuse the situation. Starting today, SKEPTIC literature will contain an additional layerr of crime-fighting security. Even now, our top Enchanters are at work weaving protective spells into the next edition of The God Delusion. Other protected works include The End of Faith, Letter to a Christian Nation, and Irreligion. In fact, even the Silver Skeptic has added another layer of security. Just by sharing this post (click one of the many “share” buttons below) you will automatically download a simple program developed by top Technomancers designed specifically to combat The Holy Spirit and other ethereal threats. Subscribing to the blog will even allow the program to automatically install any updates we publish, keeping you protected well into the future. We ran dozens of computer simulations during out meeting, and SKEPTIC is proud to announce that many common plants such as the Pea Shooter and the Wallnut are excellent at repelling zombie invasions. Keep a few of these around your home and you can rest worry-free. As a leading member of SKEPTIC, I am dedicated to helping the public combat the nefarious ploys of that accursed Necromancer, Yahweh. Stay tuned to this blog to receive weekly updates that will help you deal with threats of zombie invasions, spiritic assaults, and Cultic rituals. Tell me you know of http://www.reddit.com/r/atheism?